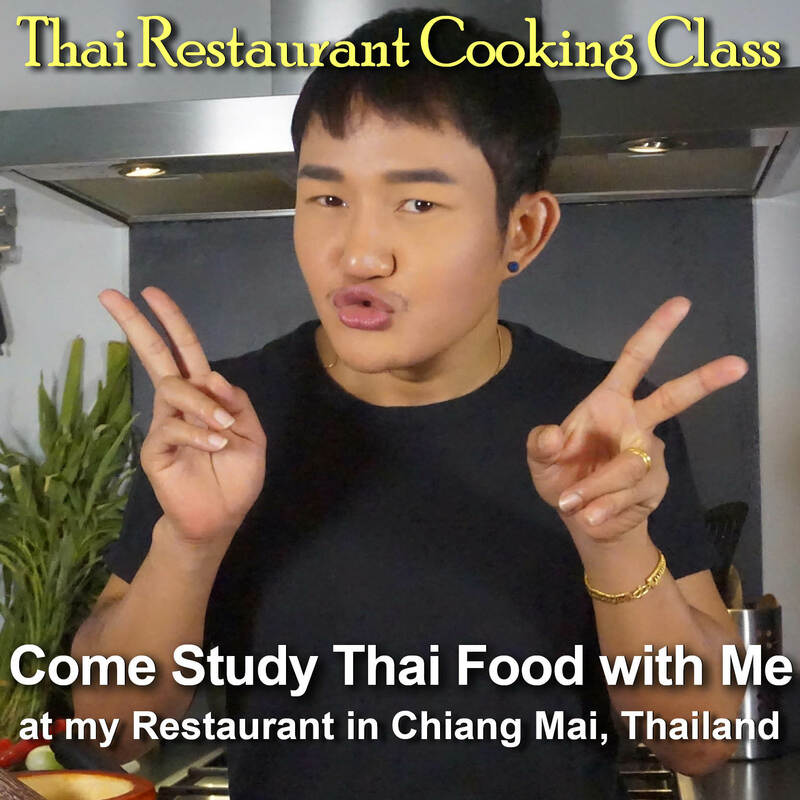 Thai Omelets are a little like a flat, solid, golden-brown pancake made of egg and other ingredients, rather than the light, fluffy, thin, and barely cooked versions included in western cuisines. Kai Jeow Moo Sap is a type of Thai Omelet where ground pork and other seasonings are cooked inside the whipped egg. This allows the juices and fats from the meat to mix with the raw egg while cooking, creating a juicy and very delicious egg dish that is usually eaten as a side dish with other foods for either breakfast, lunch, or dinner. 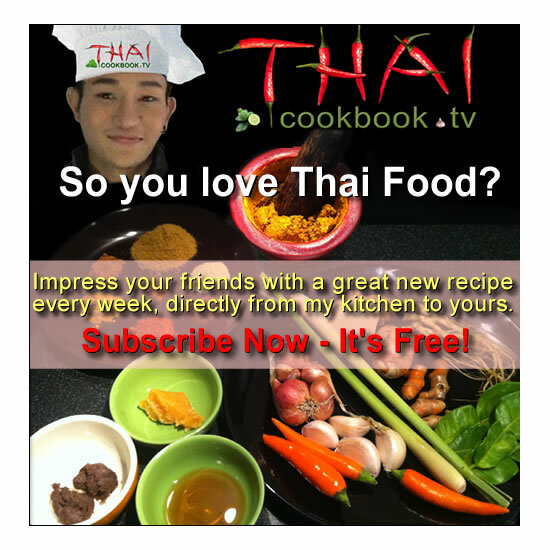 In this recipe Worawut uses the traditional cooking method, where a large wok and a generous portion of vegetable oil is used to fry the egg. 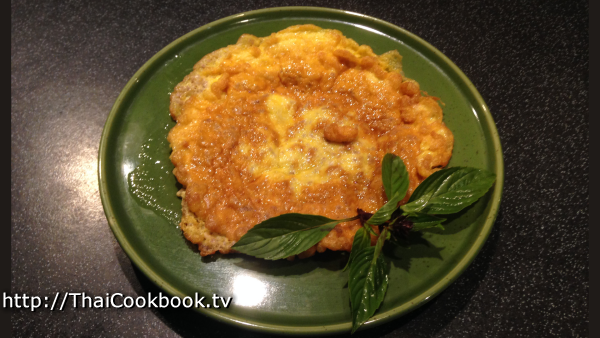 Many westerners think the Thai Omelet is too oily, so if you are trying to limit your fat intake, this recipe is probably not for you. What's in our Thai Omelet with Minced Pork. How we make our Thai Omelet with Minced Pork. 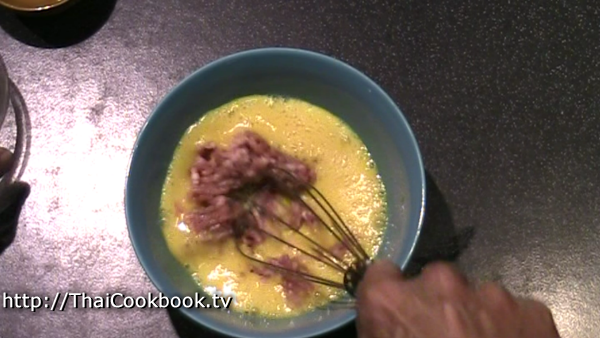 1) Whip 2 eggs well with a wire whisk or fork, then mix in light soy sauce, fish sauce, and raw ground pork. 2) Heat vegetable oil in a wok or deep frying pan over low to medium flame. Add the egg mixture. 3) Fry on one side until nicely browned, then flip over and fry until done. Omelet should be thick and very firm, well browned and crispy on the edges. Thai Omelets, just like omelets everywhere, can include an almost unlimited variety of ingredient combinations. This version, known as Kai Jeow Moo Sap, is made with just egg, ground pork, soy sauce, and fish sauce. 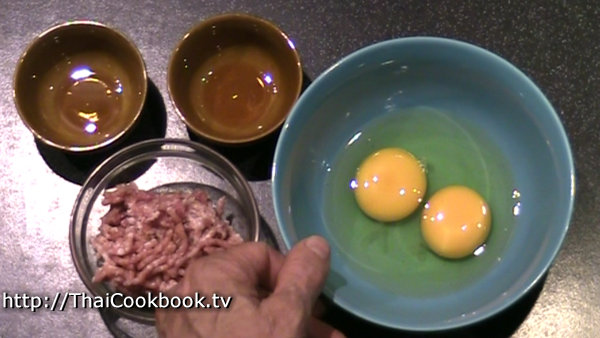 The meat is cooked inside the egg, so a lot of juices come out and mix in, making the omelet very tasty and juicy. 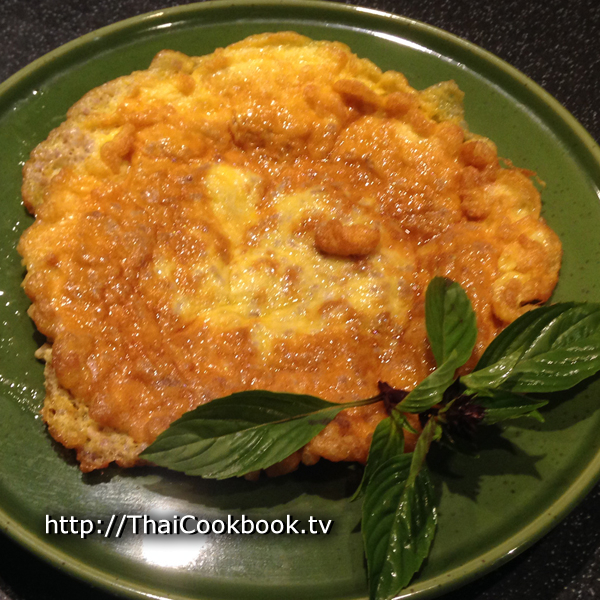 What sets a Thai Omelet apart from omelets found in western cuisines, is the way they are cooked. 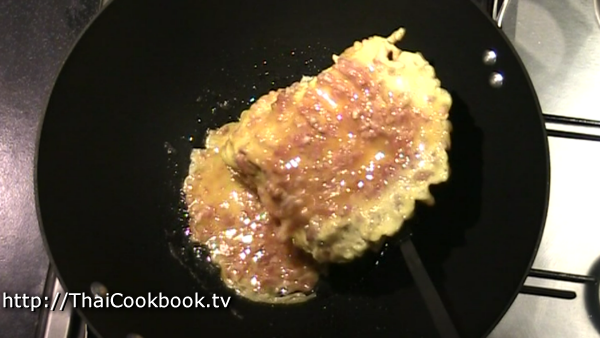 In Thailand we use a lot of oil, so that the omelet is practically "deep-fried". Whip 2 eggs well with a wire whisk or fork, then mix in the light soy sauce, fish sauce, and raw ground pork. 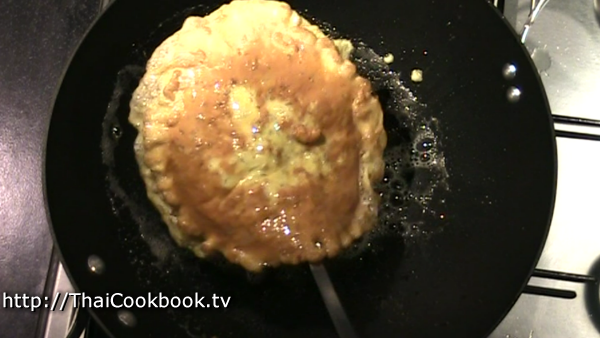 Heat the vegetable oil in a wok or deep frying pan over low to medium flame. You do not want the oil to be too hot, as this will burn the egg before the meat has time to cook. Pour the omelet mixture into the oil. It will spread out and begin to bubble. Just let it cook on one side without turning for about 1 - 2 minutes. Let it cook on both sides for a couple of minutes. It should be golden brown all over and solidly cooked. You can flip it over a few times as needed. Check inside to see that the pork is cooked all the way, and that there are no pink or red parts. When you think it's done, it is. Lift it out and let the oil run off as much as possible. You can place it on a rack and let it drain some more, wipe it with a paper towel, whatever. Just remember, Thai Omelets are oily compared to what you are used to. Serve on a small plate if you are sharing it at the table, or over rice to make a delicious one-dish meal. You can serve some sliced cucumber on the side, some spicy ketchup as extra seasoning, or prik nam blah (hot chilies in fish sauce) to make it extremely spicy.